Ever since I discovered it, I have been having a blast playing The Association Game (t.a.g.) at the OpenMuseum.org website. Soduko just doesn't do it for me -- my mind isn't rational enough -- but I can spend all morning thinking about "t.a.g." which is a kind of online party game in which artniks like myself post chains of images connected by any associations that may pop into our picture laden minds. Since I have what someone once told me is a "cocktail party mind" that loves analogies, anecdotes and unexpected connections, the game suits me to a T.
After a recent mental workout playing t.a.g. I clicked into artist Mark Trujillo's bracing exhibition at Open Museum and found myself staring at an image I found intriguing and more than a little bit strange. 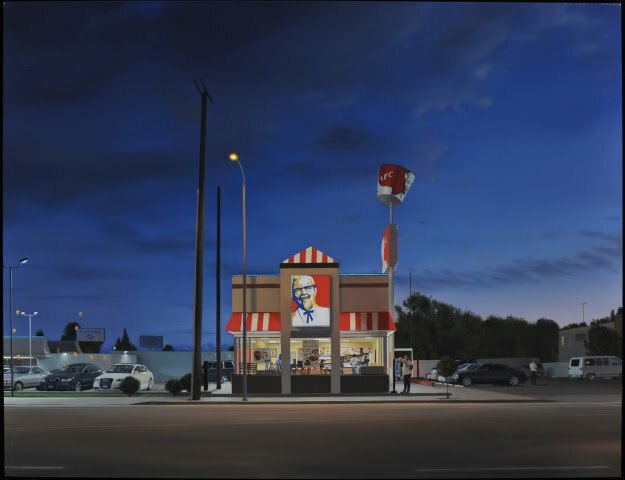 Titled simply 14522 Burbank Boulevard the painting depicts a scene that is, at first, utterly familiar: A KFC franchise, lit from within, sitting semi-forlornly on a Southern California street corner. After mulling over Trujillo's painting I asked myself "What other image does this one connect to for me?" 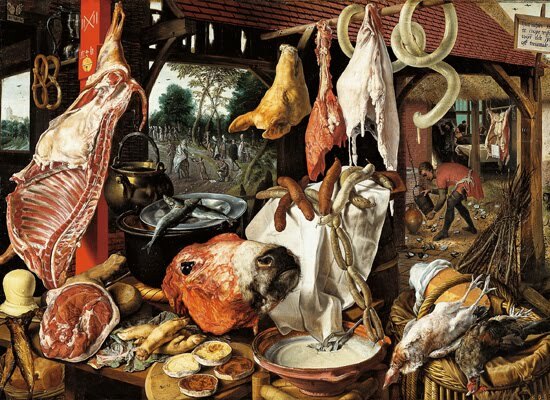 The answer to my personal game of t.a.g., surprising even me at first, was a Dutch Baroque painting of a butcher's stall crammed with fresh meat. 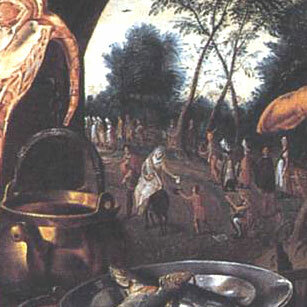 Peter Aertsen's masterpiece Butcher's Stall with the Flight into Egypt foregrounds a riveting display of meat. When I show the painting to my art history students I often hear groans of disgust: they like their raw meat to be shrink-wrapped on a foam tray. The image, with its un-plucked fowls, beef head ecorche, intestine-cased sausages, and blood puddings, is an essay in carnality, and it has the stink of death as well. If a stall like the one Aertsen depicts were to appear in my neighborhood the children would run screaming into their tract homes, and the health department would shut the place down in fifteen minutes flat. Once my students settle down, I tell them that in the 16th century this image was meant to display so many culinary delights that it crossed the line into suggesting gluttony. The Dutch of this era must have been rather like Picasso who once said that as a child he thought of the butcher shop as a candy store. Think of this butcher's stall, I urge my class, as being crammed with delights: it was the Costco meat section of its time. Fast-forwarding 459 years to Trujillo's image, I find myself thinking that one of our cultural values about food is that we want all traces of carnality erased. The architecture of the KFC store isn't meant to display food, but rather to hide it until it is served. What we get is a red and white box, part mortuary, and part circus tent, with the fryers and refrigerators sequestered in a windowless kitchen. Imagine your shock if you were to drive down Burbank Blvd, glance into the windows of KFC, and see an actual dead chicken -- like the one in the Butcher's Stall -- laid out on the formica counter between the cash registers. Of course, the gay red and white striping on the roof adds a nice carnival touch. Is it worth mentioning that "carne vale," the late Latin expression that evolved into the word "carnival" means "farewell to meat." Carnivals were the last chance to pig out before Lent. Seeing it from the street, none of us would even know that KFC was serving chicken if it weren't for the logo of the Colonel, an icon in vacuum formed plastic, lit from behind by fluorescent bulbs. The glyph of his beaming face is there to make us all children again: we are meant to want to sit in his lap under a massive oak, feasting on chicken and licking our fingers. In Aertsen's time "logos" meant the word of God, and "icons" were religious works of art whose subjects were venerated saints or other holy figures. His world was steeped in religion the way that ours is steeped in commerce, and I tend to think that any by the time that any person, actual or invented, becomes the symbol of an American corporation they have achieved a kind of contemporary sainthood. Colonel Sanders, once a real man, has been given a fast-food apotheosis, and in his immortality we idealize him, as we do all saints. What kind of cynic would point out that "Kentucky Colonel" was only an honorary title, and that Harland Sanders, who lied about his age to enlist in the army, had only achieved the rank of private? If you are wondering why my essay has veered from food to saints, you should know that Aertsen's abbatoir frames the image of an actual saint, if there is such a thing. Between the side of beef and the hanging pig's head you can just make out the figure of the Virgin, a charitable woman who gives alms to the poor even as she flees to Egypt. Above: Detail of Aertsen's "Butchers Stall"
So let's see if I can sort all this out: Colonel Sanders is a fast food saint, while the Virgin is a moral figure from a slow food world. Of course the Colonel was not really a Colonel and the Virgin had a son, but let's not go there. The dizzying contrasts -- and surprising connections -- continue to multiply as these images are compared. Mary, it seems, is there to remind us of the need for charity in an atmosphere of glut. I don't think I want to shop at a stable where flies are buzzing around the meat, but the more I think about it I like Aertsen's world, with its warning of excess and inclination towards generosity, better than the stark one Trujillo has pointed out to me. Speaking for myself, I am certainly ready for less processed food and more altruism. Our world seems to be one where we fear the image of death so much, that we insist our chicken be presented to us in a bucket or pulverized into nuggets. Does anyone else worry that our inclination to erase the presence of death from our food establishments is the flip side of a warlike society? The Butcher Stall is a grim painting -- at least by our standards -- because of its honesty about death. Come to think of it, Marc Trujillo's painting precisely shares this quality of candor even as it describes a radically different culture. It is also a realist painting that quietly makes a moral commentary. Maybe I am seeing more in his painting than Marc Trujillo had in mind, but his image of KFC on Burbank Boulevard looks more and more spiritual over time. That must be why I thought of the Butcher Stall when I saw it. In his disciplined, tightly focused painting I see a world where a the reality of death is carefully sanitized and packaged for us while a plastic saint smiles. If that sounds depressing -- and it does -- lift your eyes up to the wonderful twilight sky above the KFC roofline. Is that the polluted LA sky or a glimpse of heaven? Or both? Does anyone else think that the single street light above KFC could be a stand-in for the star of Bethlehem? If so, t.a.g. you are it!